The Women’s Super League kicked off their second round with a midweek fixture, and some games were more generous with goals than others. The WSL is now back in full gear, with the second game of the season that kicked off as a midweek fixture. After an exciting first round of games it was time to see how the teams would get on, who would take their momentum with them and make the most of it. Arsenal came away with a huge away win, as did Manchester City, but except for that, it was scarce on the goal front this time around, as Bristol and Chelsea drew, as well as West Ham and Reading. Birmingham came away with a narrow 1-0 win and are, somewhat surprisingly, trailing Arsenal in the top. Chelsea did not manage to break the deadlock away to Bristol City Women and had to go home with only one point in the bag, the same procedure as on Sunday, leaving the Champions frustrated. The new Bristol City boss Tanya Oxtoby has taken four out of a possible six points from their two WSL games and it was in large thanks to a strong performance from City keeper Sophie Baggaley, who had a good game and could deny the Chelsea attack on several fronts. It was Chelsea’s Ramona Bachmann who had the best chances of the night, with a shot dragged just wide, before she hit the bar. An immaculate save from Baggaley in the second half held Bachmann off and in the end, neither side could score, even as Chelsea were the dominant team on the ground. Birmingham City has now made it two wins out of two WSL games, after their 1-0 win against newly promoted side Brighton, and are trailing Arsenal at the top of the table in the early stages of the season. The goal for Birmingham came after Emma Follis made a good run through the centre, only to have her dragged down by Laura Rafferty, which led to a penalty that Aoife Mannion safely converted with a strong and accurate shot. Birmingham’s Shania Hayles, who just signed her first professional contract with the club, stepped on in the 89’ minute for Charlie Wellings and got to enjoy her first minutes as a professional footballer. It was not such a joyful start to the season for Yeovil Town as they welcomed Arsenal to Dorchester’s Avenue Stadium - their new regular home - and got beat 0-7 by the Londoners, especially after having suffered a 0-4 defeat to Reading in their first WSL game of the season. 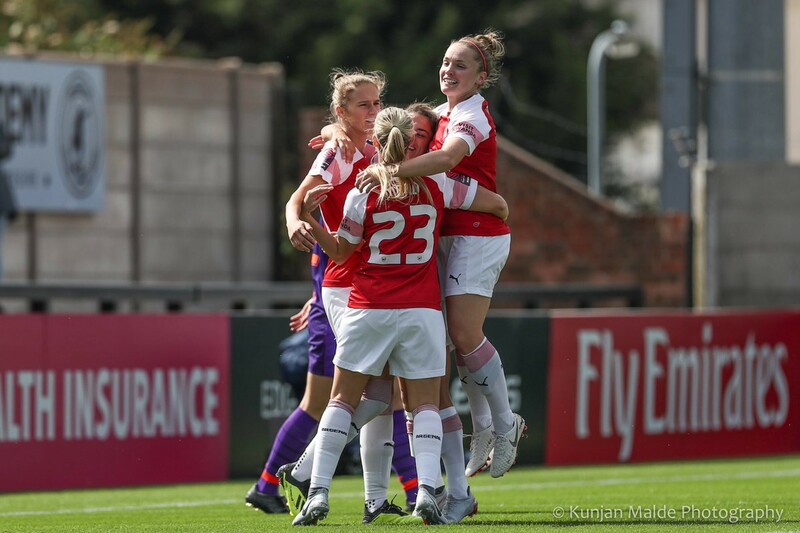 It only took Arsenal six minutes before they scored their first goal through Jordan Nobbs, who delivered a brace. That was then followed by Beth Mead’s right footed shot from close range following a corner. Then it took until just after halftime until Katie McCabe, fresh off the bench, took a shot with her left from the centre of the box, which went in, only to see Vivianne Miedema make the score 4-0 moments later with a shot to the bottom left corner. Nobbs then got on the scoresheet again, as she took a shot from outside the box and landed it in the top right corner. Not far thereafter Dominique Bloodworth was the one to get it in, with a shot from the left side that went into the bottom right corner, and then rounding it off to make the final score 7-0 was Kim Little, with her right foot. Yeovil got a 0-0 draw with them the last time the two sides met, but it was not meant to be this time around, and whilst Arsenal are showing early signs of intent at the top, Yeovil is yet to claim a victory in the top-flight. West Ham debuted in the Women’s Super League and could claim a point to go with it, as they played 0-0 against Reading. Although none of the teams could score, it was an even game and West Ham - who have just moved up all the way from tier three to tier one during this summer - held out well. It was the West Ham keeper Becky Spencer that deserved most of the credit after pulling off several vital saves to keep the Hammers in the game. A shot from Fara Williams was neutralised and took on Brooke Chaplen in a one-on-one in a potentially dangerous situation. Also in the second half, it was Spencer who deserved most of the credits, after punching away Williams’ free-kick, only to follow that up with another save on an attempt from Chaplen. City had started off their campaign with a 0-0 draw against title rivals Chelsea on the opening weekend of the WSL, and were eager to show their intent for the upcoming season, and a class effort sure did. It was already in the 14h minute that Georgia Stanway opened up the scoring for Man City with a shot curled around the post. Thereafter it would take until the second half before Nikita Parris stepped up for City and her right footed shot went in, which she then followed up only minutes later with another shot from inside the box. Claire Emslie would then make the final score 0-4 in extra time with a clean shot, first touch, that went into the top corner. Everton has yet to score a goal, following their loss to Birmingham on the opening weekend and will look to bounce back from these results, but they stood without a chance after a forceful performance from City.